Ileitis, a common disease of grower and finisher pigs that can cost producers thousands, will be the subject of an address at the 2011 Australian Pig Vets meeting in Melbourne in July. Pork CRC is a major sponsor of the 2011 Australian Pig Vets meeting, supporting keynote speakers Dr Alison Collins and Dr Huub Brouwers of the NSW Elizabeth Macarthur Agricultural Institute (EMAI), Dr Megan Edwards of ACE Livestock Consulting, Dr Sue Yen Woon of Rivalea and Professor Mary Barton of University of South Australia. Dr Alison Collins has researched ileitis and with the support of Pork CRC is developing two new diagnostic tests to help veterinarians and producers manage the disease. The first ileitis test is designed to be easy to use ‘on-farm’ and is intended to confirm if ileitis is causing scouring in individual pigs. The second is a laboratory test that can quantify the number of Lawsonia (the bacteria which cause ileitis) shed in pig dung. Currently available ileitis tests do not differentiate between low and high numbers of bacteria. “Use of both these tests will help producers evaluate the efficacy of vaccination, antibiotic medication, timing of medication strategies and improved hygiene, to control ileitis and reduce associated production losses,” Dr Collins says. Dr Huub Brouwers is part of a group at EMAI that studied the ecology of pig intestinal microflora, using techniques that explore bacterial DNA and virulence determinants. This research has led to the selection of E. coli probiotic candidates that have been used successfully in laboratory studies. “While these organisms don’t cause disease, they have the capacity to block the proliferation of those that do, hence field trials are underway on properties in NSW and Queensland to further test efficacy,” says Dr Brouwers. Dr Megan Edwards’ PhD research, also supported by Pork CRC, found advantage in creep diets containing spray-dried porcine plasma and pre-weaning exposure to creep feed, with benefits more pronounced in progeny of primiparous sows and piglets that weighed less than 8kg at 28 days. Reduced mortality and morbidity through the nursery phase was associated with beneficial manipulation of intestinal microflora and down regulation of the immune system in the acute post-weaning period. “Interestingly, benefits of the nutritional strategies tested not only influenced enteric diseases, but also susceptibility of weaners to respiratory diseases,” says Dr Edwards. According to veterinarian and Pork CRC Sub-Program Manager, Dr Ross Cutler, probiotics provide a complex research environment. “Historically, findings have been very mixed, but the EMAI results look promising. 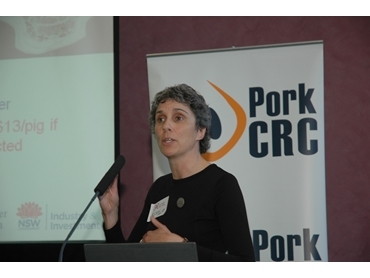 “For the Pork CRC project, EMAI has formed a partnership with International Animal Health, meaning the path to field adoption, solutions and market is relatively assured, almost as soon as positive results are demonstrated,” says Dr Cutler. Dr Mary Barton’s research is examining how to use bacteriophage, or naturally occurring viruses that attack bacteria, to control post weaning E. coli disease. This field has been researched by Russian scientists for the past four decades, but its direct application is still probably some time away. “Mary’s presentation will bring Australian vets up to speed on new developments in a rapidly changing field, as the way animal industries are able to use antibiotics is changing worldwide. “On some farms microbial resistance to medications necessitates changed practices and the Pork CRC research is playing a major role in identifying those practices,” says Dr Cutler. Researching baby pig survival, Dr Sue Yen Woon has harvested sow serum at slaughter and used it as a ‘vehicle’ to deliver Immunoglobin G (IgG) to young pigs. IgG is usually delivered naturally via colostrum, with small pigs, or those born late, being at high risk if receiving low levels from their mothers. “While Sue Yen could not improve survival, her Pork CRC supported work provides valuable insight for those trying to improve baby pig survival,” says Dr Cutler. According to Pork CRC CEO, Dr Roger Campbell, the 2011 Australian Pig Vets meeting in Melbourne will bring pig veterinarians working on-farm together with pork producers and will Pork CRC research findings to be vigorously debated, subsequently assisting the important adoption and commercialisation process.